The clothing labels inside of your clothes are more than just a way to see the size. The labels often represent the name of the designer. This is an easy way for designers to spread their name and designs around the public. Labels are not only for professional designers. If you have a knack for creating your own fashion designs, then you just might need your own labels. With a label, you can make sure everyone knows who designed each piece. With a label, you can give your finished products a professional look, just like something you would find in a designer boutique. You can also use a label to add any special care instructions, as well as size information. Here at It’s Mine Labels, we specialize in all things labels. Whether you need a simple label with a simple business name, or you want something more extravagant with more garment information, we have it covered. 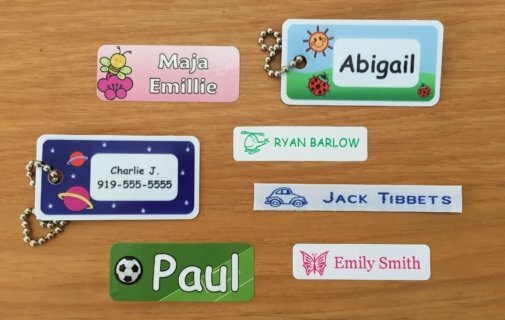 Our labels are available in sew-in and iron-on styles, and we even have labels that snap-on. You can add several lines of text, if needed, and you can choose from a variety of fonts to create your perfect style. In other words, you can personalize the label to meet your custom needs. Creating and selling your own fashions is a great way to create repeat customers — labels can help you spread the word about your fashions and gather new customers. Contact us today to learn more about our labels, and let us help your fashion line become a household name.